Probably shortly after having the first inscription carved in Persepolis, ‘Adud al-Dawla returned in the ancient Persian site to make another inscription, celebrating his victory over Isfahan. The text provides only the year, without recording the exact date. 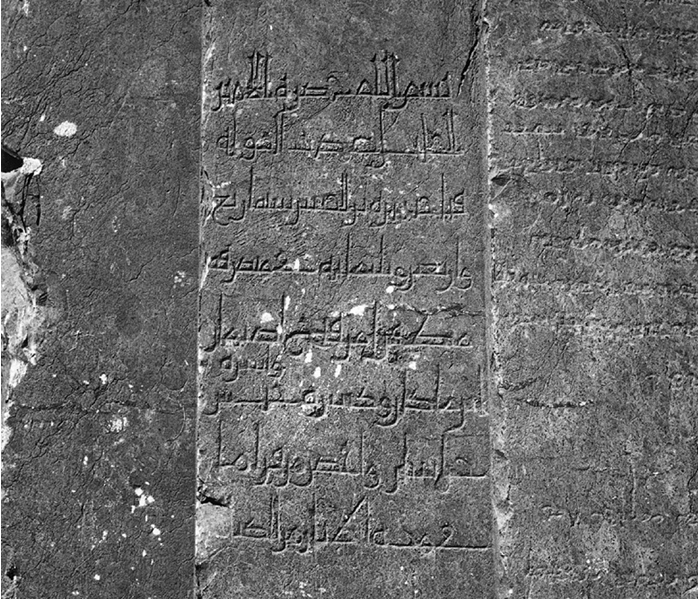 Sheila Blair, anyway, dates the graffito later than the first one carried out for ‘Adud al-Dawla in Persepolis, basing on the titles given to some peculiar features of the text: in her words “its place is more prominent, its titulature more studied, and its script more meticulous”. The battle does not provide actual clue for what pertains the date: we do not know exactly when it took place, bt we know that the attack was lead by Ibn Makan: here we learn that also ‘Adud al-Dawla took part in it. Again it is important how the commemorative inscription clearly states how the Buyid ruler wanted to underline his Iranian ascendancy. In the first place, he decides to have his first name Fannakhusraw, which evokes Sasanian ascendancy, clearly recorded. Then, the graffito is inscribed next to the Parsik inscription carved in the reign of Shapur II (309-379 CE), associating himself with the Sasanian monarch. Once again, the last part of the inscription clearly states that the Buyid ruler was aware of the placement and of the importance of the place. Next Post Mary and Jesus or Maryam and Isa?